In addition, Gallup research in 2009 found that Religion is typically far more important to the population in poorer countries than it is in richer countries and that there is a direct correlation between economic prosperity and religiosity. 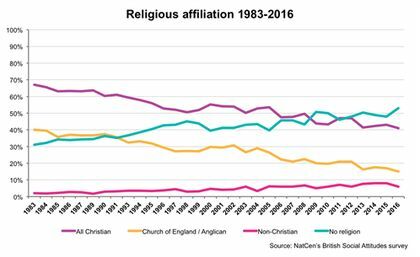 If rates of religiosity in Britain have a relationship with the economy, then the place that religion has in 22nd Century Britain may depend on the long term economic future of the country. Of course, the relationship between religion and economics was charted more than 100 years ago by Karl Marx and then by Max Weber, who both understood how religion can function as a tool of capitalism which keeps ordinary people motivated and engaged with the market and the political system which puts it first when it singularly fails to benefit them. Of course with Brexit on the immediate horizon, continuing problems with managing the deficit and the housing market, the national debt and the longer term effects of world population growth, climate change and resources depletion, it is difficult to forecast what the economy will be doing in five years time, let alone into the 22nd Century. It could be that Capitalism will collapse before that time; Marx predicted that it will. Suffice it to say that there is a real possibility that Britain will be poorer in the future, and that with the decline in its finances the country could see an increase in the number of people expressing religious affiliation… and even attendance (assuming that places of worship continue to function for long enough to benefit from an upturn in numbers that is).